51.4-Miles of fear and family. In the ultrarunning world the name Badwater carries weight and respect. The Badwater 135 maybe the most widely known race in the world. Aside from the Barkley Marathon which eats you alive the original Badwater maybe the toughest to finish. Starting in Death Valley, in mid-July, runners travel along some of the hottest conditions on the planet to finish 135-miles later running up Mt. Whitney. Badwater is a series of races and it is also “a family.” Each Badwater race is unique, each have a distinct personality and frankly each are challenging in their own right. 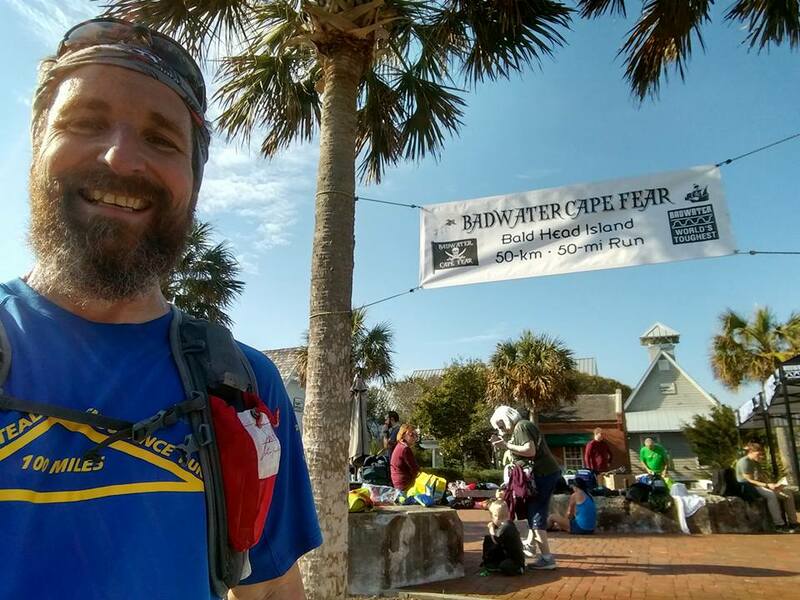 Badwater Capefear offers a 50k and 51.4-mile option depending on the amount of suffering you would like to endure. I choose the 51.4-mile option because I wanted to experience some suffering to help prepare for my run at Leadville latter in the year. By the end I had, had enough of Baldhead Island. Going into this race I didn’t fear the distance or any weather conditions that cropped up and I didn’t fear being active for the time required to complete this race. I did have some fear of the sand. The only time I’ve run on sand was in 2012, I ran 8-miles with “the Raven” on Miami’s south beach. That run left my legs tired and my lower back very sore. I would have to run nearly five-times that distance. Running on the sand turned out to be no big deal, if you stayed on the hard-packed sections. If you ran off into the loose, fluffy sand you were dead meat. Arriving on the beach just as the tide was going out was a reward for running a conservative opening 13.2-miles. Low tide provided a wide running path for most of the beach legs of which we would run “out and back” two times for a total of 39.2-miles. Notice I said we had a wide running path for the “majority” of the day. Running on the beach was awesome, the ocean on one side, mounds of sand and vacationers on the other. The day was filled with sights and sounds you don’t normally get to experience. The early miles clicked off rather fast as I was on sensory overload. Running on the sand was also a pain in the hips, ankles and knees. In advance of the race I feared the potential energy sucking soft sand. I didn’t give much thought to the cambered surface. It did not take long for this un-level surface to rear its ugly head. Mid-way to our 1st turn around I noticed some dull discomfort developing in my right ankle. At no point was it race threatening or a hindrance it was just another ultramarathon thing that pops up that you must overcome and manage. After a great pitstop thanks to the volunteers it was time to push on for Fort Fisher and our turn around point. Going into the race our group (Wendy, Catie, Jeff, Scott, and Lyndsey (she jumped from the 50k to 51.4-mile option midway in the race…Rock Star)) decided to stick together, no PRs, no golden tickets just a day of experiencing Badwater. We stayed on pace all day as Catie paced us with a 4/2 interval. Many I’m sure looked at us in the initial stages and wondered why we were walking so early in the race. It was at the turn around on the first leg that I noticed we were catching up to the “faster runners.” An ultramarathon is an all-day battle not often won by the early swift. Our running group was awesome, supportive, welcoming, fun, and encouraging as we became the talk of the race. We arrived at the Fort Fisher turn with a few new members, a lot of laughs, and a few stories told along the way. Running south on the beach provided the relief my ankle needed yet also introduced something ominous for latter in the day “the wind.” With 22-miles down the thought of finishing my first Badwater race came into view. It’s funny what motivates you during a long race. A buckle, a medal or simply being a finisher is sometimes all you need to keep focused on your goals. As vain as it may sound, the Badwater Capefear belt buckle was something I wanted, something I wanted to earn and as the miles grew long something that kept me focused. Our group made good time working our way back to the turn at the conservatory and the future finishing line of the race. An ultramarathon, no matter the distance can be filled with highs and many lows. I tried to capture the drama of a 100-mile race in my book Running to Leadville. Heading back out on the beach I kept in mind a tried-and-true battle plan, “keep moving forward and focus on the small victories.” The thought of running the entire 9.8-miles to Fort Fisher seemed daunting as the sun began to set, the wind kicked up and the tide moved closer to shore. Viewed in its entirety it is easy to see why ultramarathoning and tackling life’s bigger issue can be defeating. With steady progress and my mind’s eye focused on my first little victory, making the mid-point aide station, the final leg seemed more manageable. Departing the midpoint aide station my focus was getting to the turn around and the final leg of our adventure. Passing runners coming back from Fort Fisher made it clear the toughest part of the race was still in front of us. The 4.8 miles to Fort Fisher were uneventful. We ran, we talked, and we laughed. At times, we commented on how hard it appeared the runners moving in the opposite direction were working. At Fort Fisher, I took time to visit “the real bathroom” as we began to call it to take care of business and as an afterthought before walking out I took time to wash my face. The cold water felt so refreshing. I want to say it supercharged my legs and the final miles went by in record time but that would be a cause and effect story only believed on the silver screen. In fact, having a clean face put a slight bounce in my step and allowed me to face the finishing leg in positive spirits. The wind was wicked and cold on the return trip. Our group battled together, Catie kept a steady pace with each of us taking turns ensuring no one got dropped. We had been together all day and although it had never been said I believe we had an unspoken bound that we were going to finish together. The toughest part of the day for me was the final mile on the beach, not because of the wind, not because of the sand and not because of our pace. The last mile kicked me in the head because when I saw the signs for the right hand turn on the course that marked the elbow in the beach, I thought those were the signs for the end of the beach section. Once I figured out my mistake I was a bit crushed. I had a mile plus still to go. My first thought after collecting my emotions was that this must be what the false summits of Leadville feel like. I put my head down and was determined to finish strong. When the final turn came upon our group we were a bit spread out as running in the soft sand that led onto the beach section caused us to get drawn out. Our group of six joined up and ran the last .5 miles on the road back to the Baldhead Island Conservatory together. We finished proud, smiling and with our arms raised in victory. 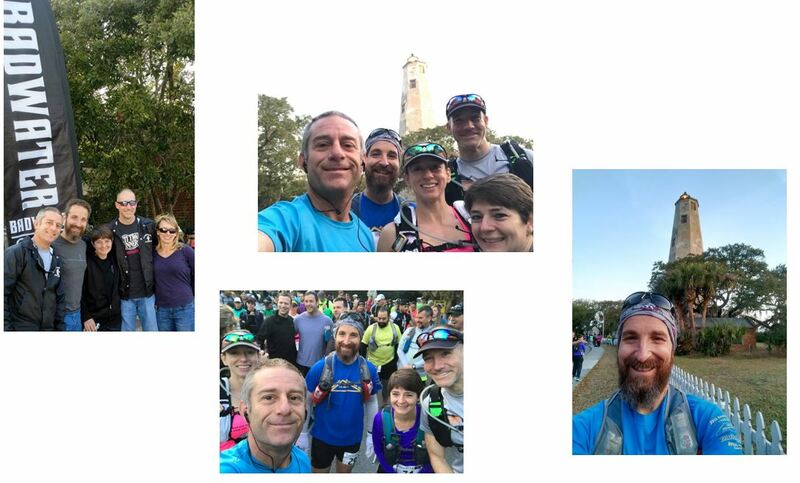 Victory came not only for finishing, but for the bounds we shared hanging out together during the Badwater Capefear 51.4-mile race. This entry was posted in Uncategorized on March 30, 2018 by burk.brian@yahoo.com.